Etsy's Shop Updates have been around since the end of 2015. How have they worked for you? It seems that a lot of sellers don’t take full advantage of this great tool. Do many still lack mobile devices? Or is it because sellers don’t see the point? Why should we do shop updates? Shop updates in my mind take the place of treasuries. (Admittedly, they are not as much fun.) Shop updates appear on the front page, increasing the exposure of our shop. We can upload photos of our items and other associated pictures and market our shop. It's a golden opportunity to show our creativity, and make a connection with the followers of our shop. 1. On our Home Page. 2. Next to our About Page. Between our reviews and About Page. They represent our shop, our brand. Shop Updates can build trust as to the authenticity or our shop, our love for vintage, our seriousness as a vintage seller. We all have the opportunity to tell our shop’s story on a day-by-day basis. Isn’t that better than just once? At the same time, we can share our Shop Updates on some social media channels. It is a mini-blog, a form of shop promotion. 2. Favorited an item from the shop. 3. Bought something from the shop. 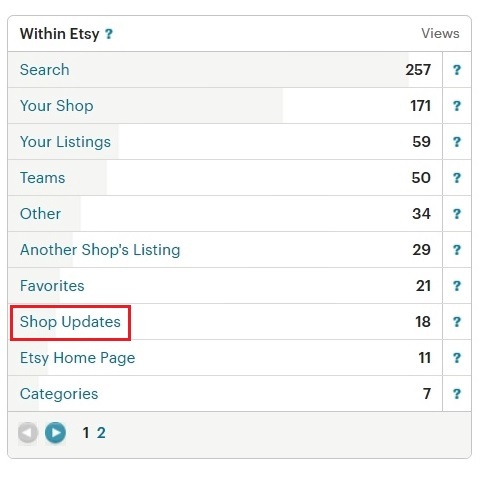 If you're at all active browsing on Etsy, you will have updates coming through your feed. If you don't like a particular shop's updates, just shut them off (three little dots in one corner). In my shop, I notice that featured items have a higher rate of selling. Other sellers feel the same. Perhaps our shops get a little bump up when we post. Or perhaps it is just the extra exposure our item receives. You must have a mobile device that runs on iOS or Android. The alternative is to load an Android emulator on your PC (something like BlueStacks). 1. 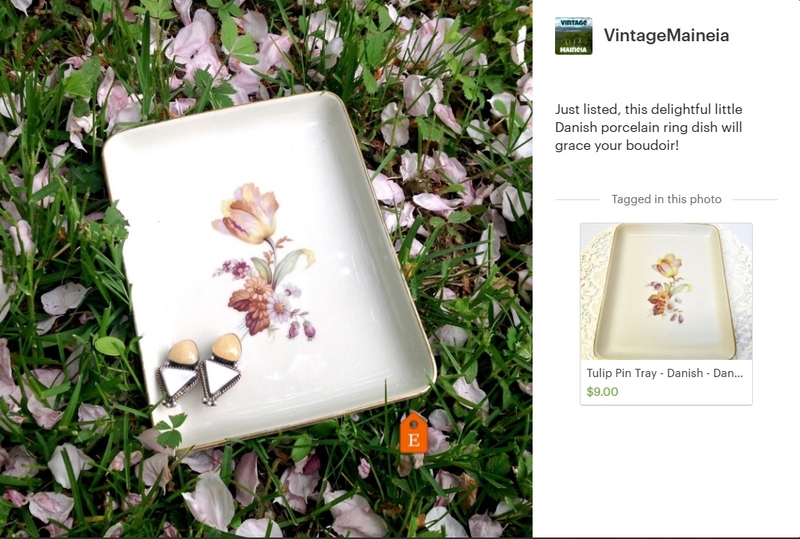 Open "Sell on Etsy" app on your smartphone or tablet. 2. Select "Shop Updates" in the menu (top left corner). 3. Push the blue bar that appears across the bottom. 5. Pinch and zoom. You can tweak your photo. (You will want to do any major editing before this step.) Select “next” in the top right corner. 6. Tap the photo is the spot where you would like the orange Etsy tag to show. 8. Adjust the tag placement if necessary. 9. Type a sentence or two that addresses “What is happening in this photo?” Be brief and upbeat. 10. 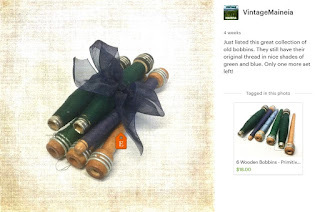 Push the blue bar, “Share on Etsy” which publishes it. 11. A screen gives you the option to share your post on social media pages (Facebook, email, SMS and "Copy"). It's all done. Wasn’t that quick and easy? Shop Updates show up on your feed from shops you have favorited or bought from. They are also part of our shop’s front page. 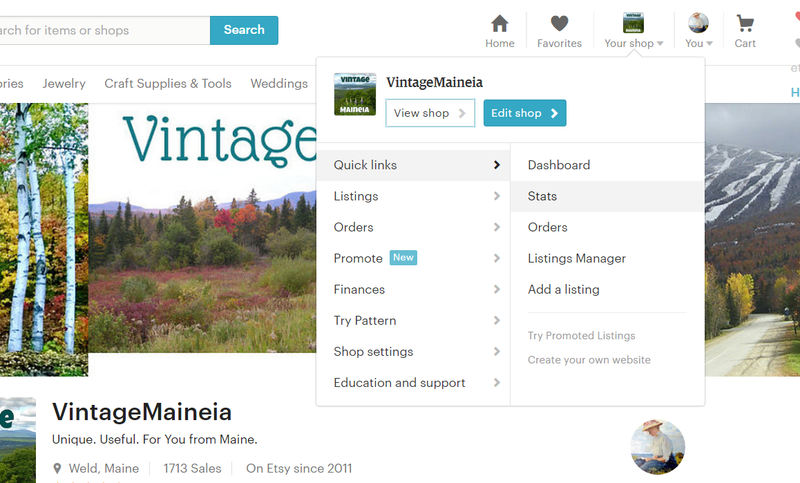 Shop Updates are positioned between your reviews and About Page. On your feed, you can hide certain updates, or all updates from a certain shop. (I do that if a shop just posts the same pic of their item that is on the listing or I don’t like their stuff, or if they just post too many updates in a row.) Look for three dots on the bottom right corner of the update you want to hide. Etsy is a venue designed for creative enterprises. It can seem daunting to come up with ideas for vintage shops. See dozens of ideas for vintage sellers here. Some shop owners object to seeing their own updates in their feed. 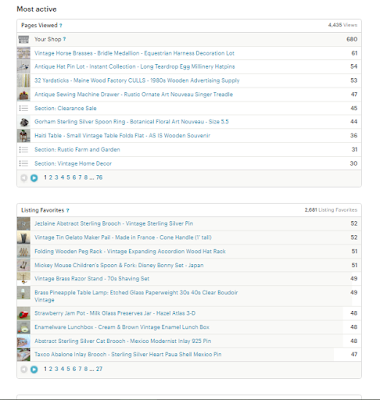 However, Etsy is letting us see how our updates fit into the rhythm of the feed. How often does your Shop Update feed refresh? I’ve read that once every 2-3 days is a goal to try. I actually aim for once per day, but sometimes miss. 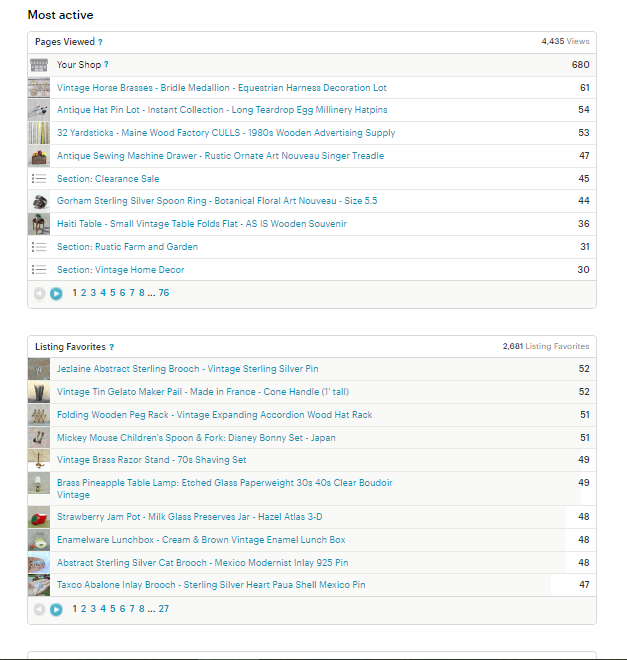 Shop Overview Dashboard. Look for patterns. It may seem like common sense, but I recommend placing your Etsy tag as close to the item as possible or even on it. 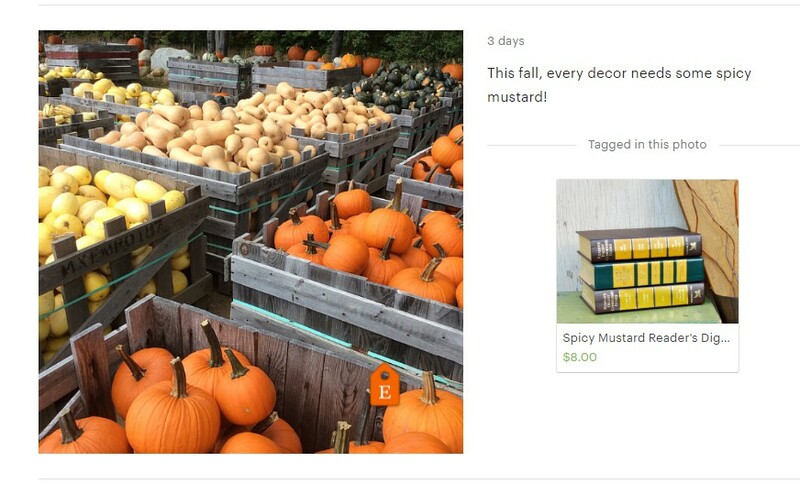 We wouldn’t want our featured item to be removed from the photo during any cropping. Using hashtags in our shop updates may improve our post if we plan to publish it across certain social media channels. Sometimes it is necessary to edit or delete a shop update after posting it. 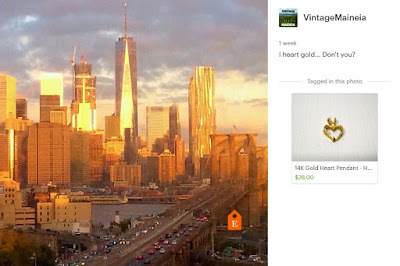 To do that, open the Sell on Etsy app. Select the post. Your options appear when you tap the three dots in the top right corner display: delete, edit caption, move tag or share. 1. In the right-hand column (traffic from within Etsy). 2. 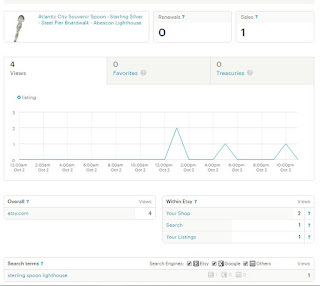 Shop overview dashboard. Hold your cursor over days/months(/even hours). Below the chart it will tell you how many shop updates within that period. 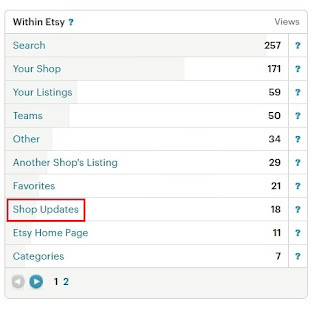 Here is more information from Etsy about Shop Updates. 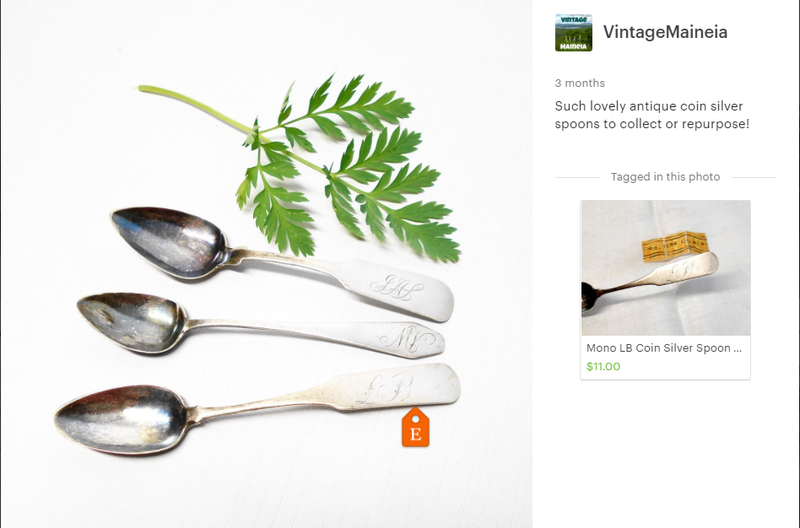 (Please note that the illustrations show Etsy's "old" stats." Now that we have examined our shop stats in detail, what are they telling us? Here are eight points for starters. 1. Lots of views? If a particular keyword or key phrase is bringing you a lot of views, make sure it is being used in all applicable tags and titles. 2. No views? 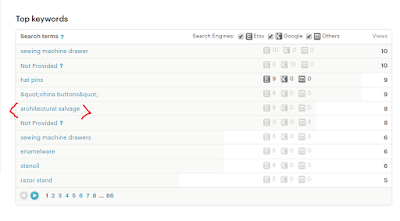 If some keywords never appear in your shop stats (or are at the very bottom), these tags aren't bringing you views. Replace them with other words or phrases. 4. 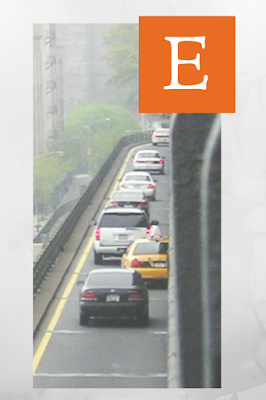 Is your social media traffic so high that it brings in more traffic than Etsy itself? 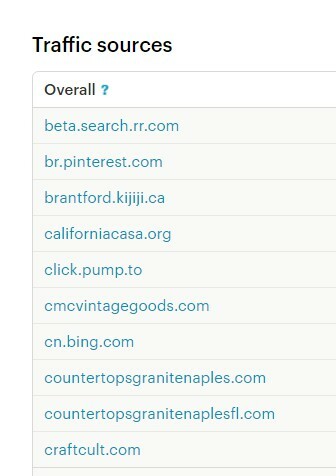 (Check the top of the left-hand column for overall traffic.). That can mean that you are ready for your own standalone website! 5. Often I can tell what will sell soon because of increased views and favorites. Can you source (or make) more of the items? 6. 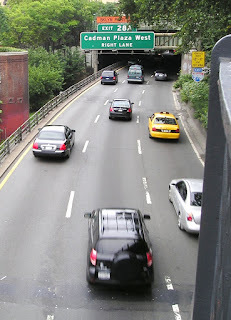 Is a site you don’t recognize driving traffic to your shop? Google it. Consider sending a thank-you message. Offer to send them your newsletter. If it is a blog, find out who the audience is. Are you marketing to that audience? 7. 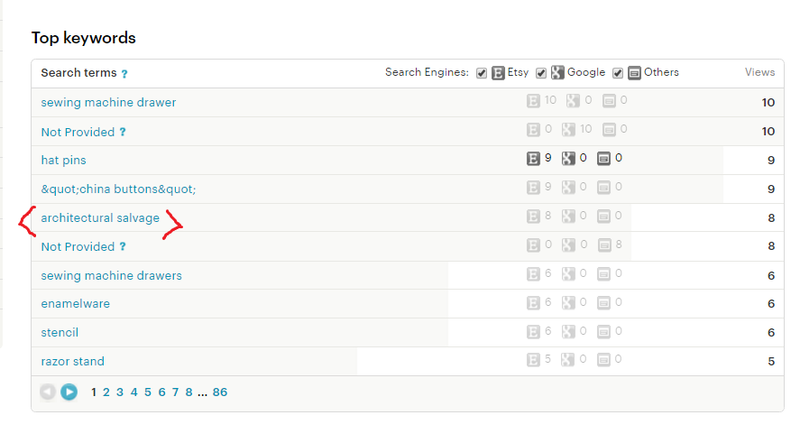 "Search" should be in one the top three spots in Etsy traffic sources. 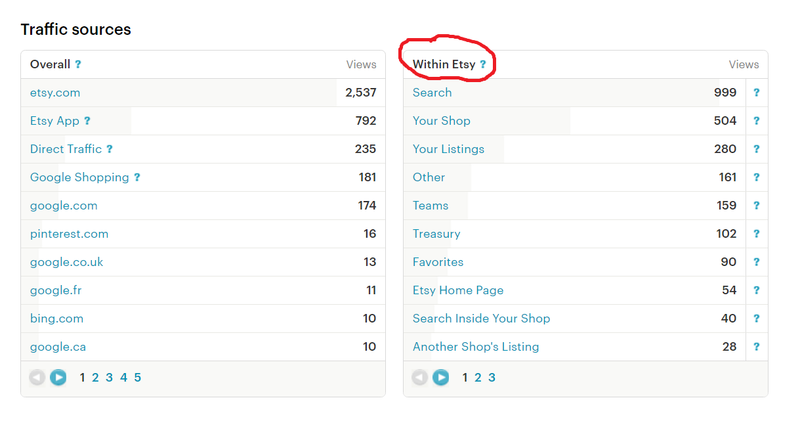 If not, you need to optimize your shop for Etsy search. 8. An item sells well. What key words are bringing in your buyers? What are your primary traffic sources for the item? Could you use this information to improve other listings? Could this data help you better market other items in your shop? DISCLAIMER: I am not a statistical expert by any means. I am sure that there are probably a few errors in this tutorial. Please keep this in mind when following the indicated steps. 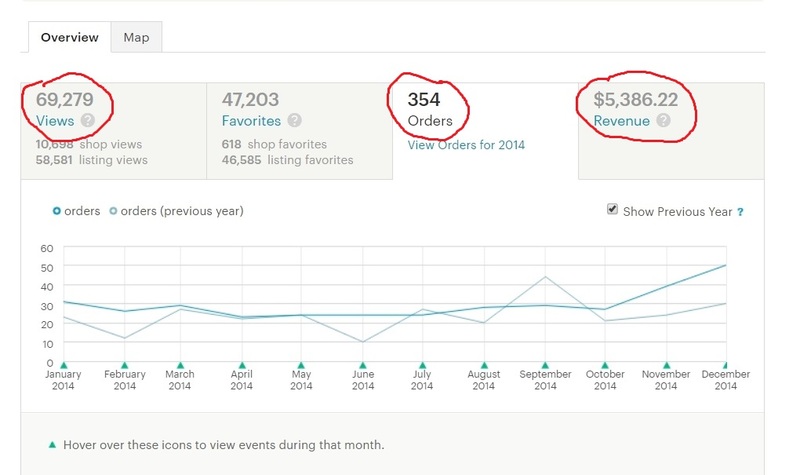 Here is a secret about your Etsy stats. 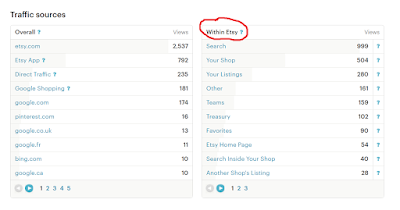 Many sellers don't realize that Etsy also provides stats for each individual item. This can be valuable information. I'll give you all of the tools to unlock them! To access your individual item stats, open an item. There is a "Bars" button right above the picture. Select "today" (or the day you are interested in) for the time. Select the "Views" tab. 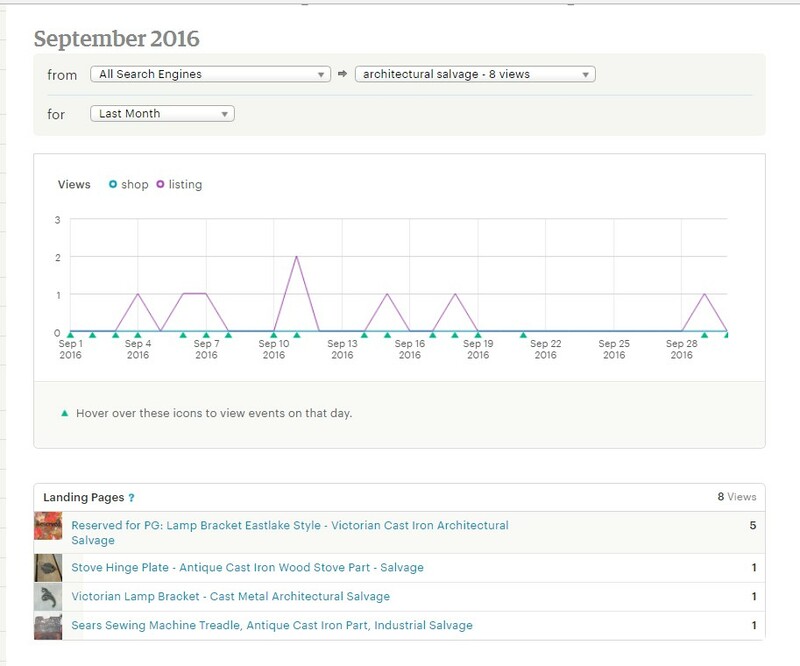 You can also see search terms used to find this item during the date range you selected. How did the buyer find our item? 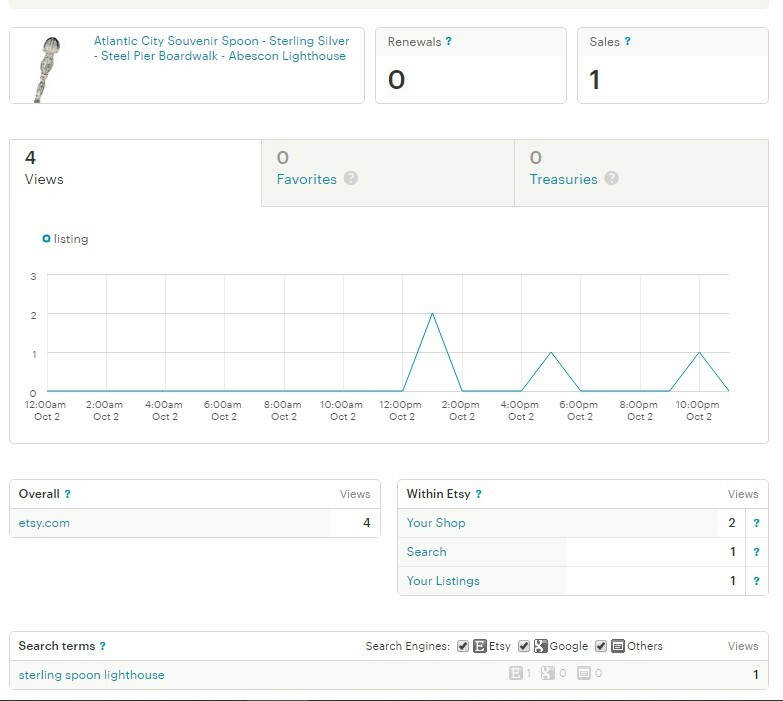 This feature is especially handy if you sell an item and wish to know how your buyer found the item. Check your individual stats for that item on the day that it sold. How many sets of keywords are there? Was there one keyword (or key phrase) used on the hour that the item sold? Then you know definitively. Individual stats can also help monitor clicking team games. This only works if you don't have too much clicking data to muddy the waters (i.e. promote an item in only one place). Open the item stats for the item in question for the day in question... See the graph? It tells you how many times and even what hour of the day that it was clicked. This gives you a good idea if people are clicking when they should. If I sold this item at 7 PM, what search words did my buyer likely use? 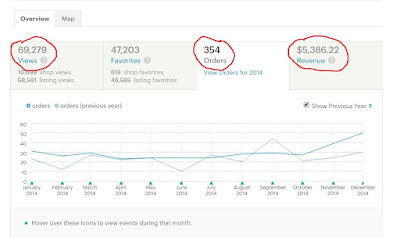 See how to use your individual item stats to improve poor performing listings. 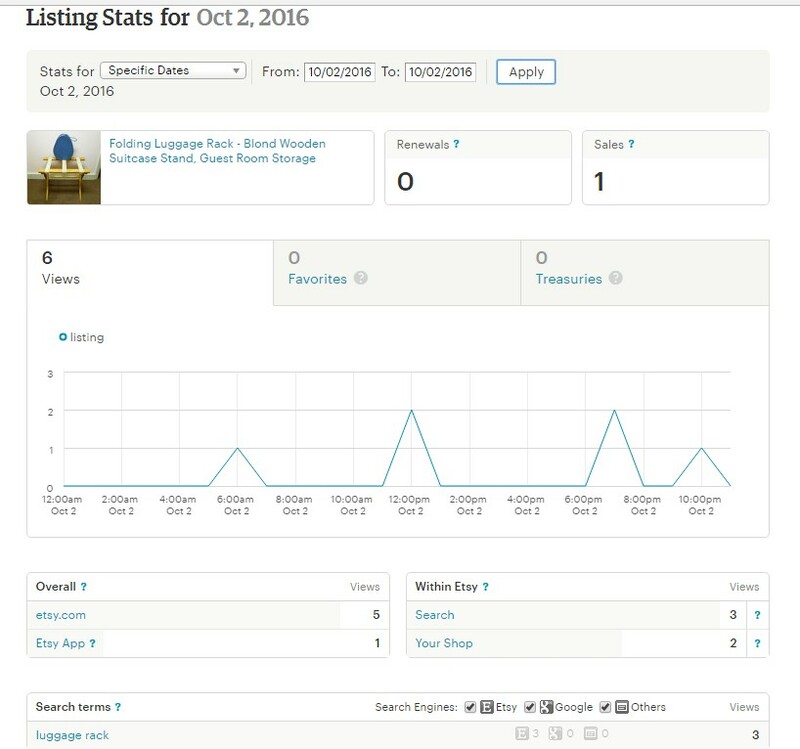 Individual listing stats can be our "secret weapon" to learn details about how buyers find our listings. Don't neglect this powerful tool! 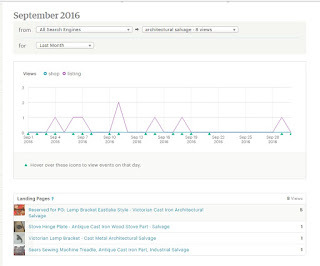 Do you open your Etsy stats page every day? I do. Particularly revenue: how much have I sold this week? How does it compare to last week? Last month? However, stats can be much, much more. Etsy was not created to be just a sterile place to buy and sell. It was designed to be a vibrant marketplace to discover things that you didn’t even know you needed or wanted until you saw them. Etsy is a form of social media in that respect; social media where everything is for sale. 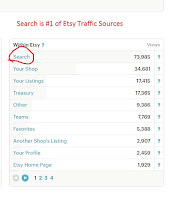 Etsy Shop Stats provide insight into exactly how shoppers find our items: the keywords shoppers search with, the sites that link to our items, internal links… the many pathways to discovery, and hopefully purchases, in our shops. 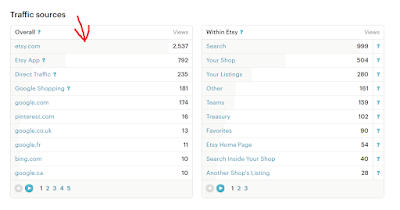 Stats are a powerful tool from Etsy if we harness their power. We do that by reading what our stats say and understanding their message. Savvy sellers use the information to make improvements to their shops, their listings, and even their social media. 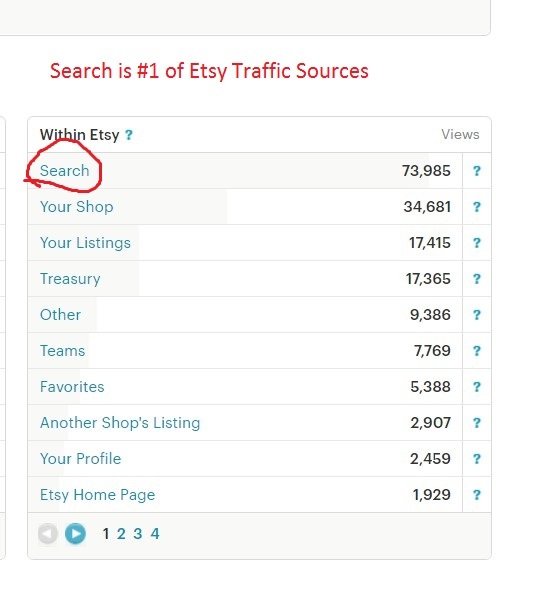 This series of blogs will help you unlock the power of Etsy stats for your shop. 1. Go to the top right corner of any Etsy page: Your Shop > Quick Links > Stats. 2. 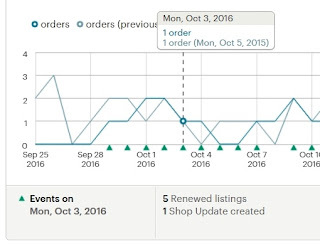 Use the setting “Last 30 Days” for a broad view or even “Last 12 months” (if your shop is new). This is the chart toward the top of the page. 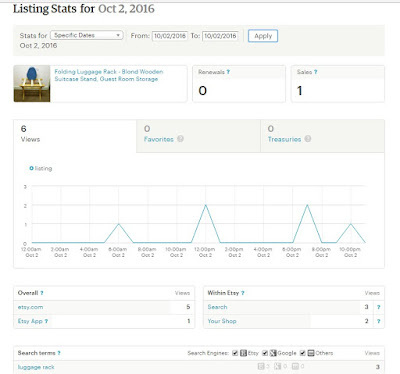 It shows data and graphs for views, favorites, orders, and revenue. There is a field just above the chart to set the date range. Hold your mouse over the graph for different days (or months or hours). Find a time period with particularly high numbers. Then look at the area below the chart. It shows if items were listed, renewed or you released a shop update. 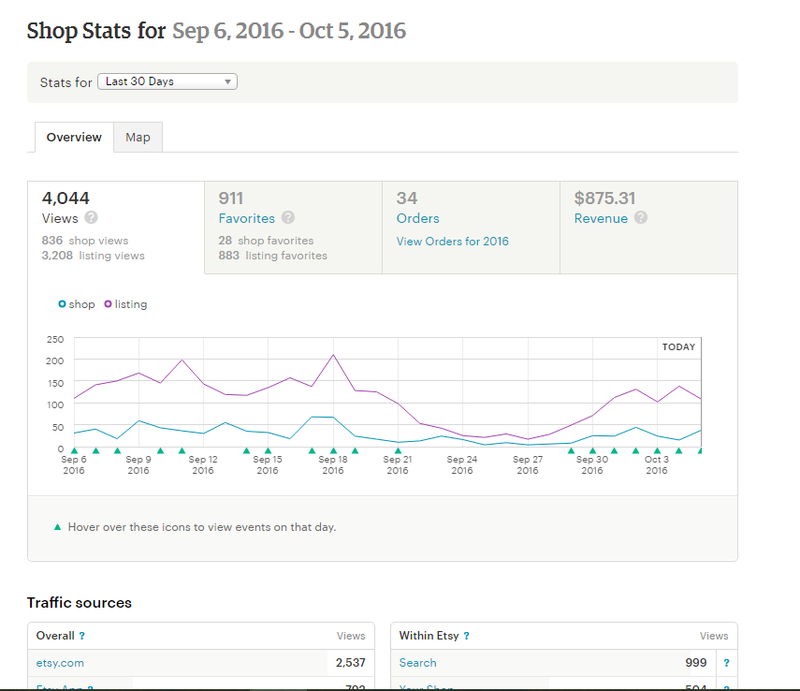 This is a taste of the power of statistics: to determine if what we are doing with our shop actually shows results. Hold your mouse over a time period to see what events happened. 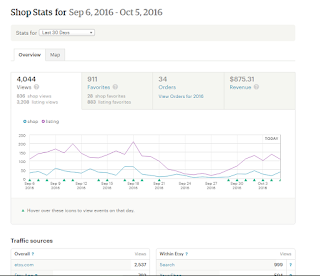 Below this dashboard chart are two traffic columns: “overall” and “within Etsy.” We will discuss these next. Stats have been available on Etsy since early in 2012. How have they helped you manage your shop? 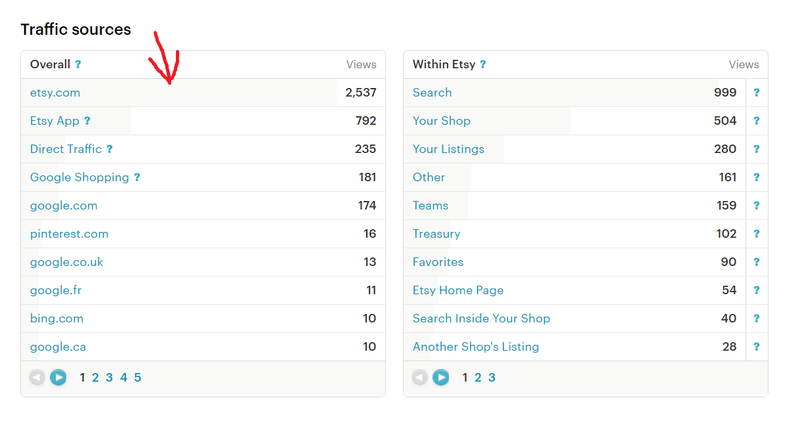 More information on shop stats from Etsy is here. Etsy shop updates are like a mini-blog. They are an opportunity to market your items to potential buyers. The more updates you post, the more often you appear on the front-page feeds of those who like your shop. Also, you can share your updates to social media channels. They link back to your item, making it easy for shoppers to make a purchase from your shop. Etsy wants you to use images that aren't the same as our five listing images… What a great opportunity to showcase your brand. And exercise your creative side! What is your inspiration? A barn shop? Grandma’s place? Your own collection? Show it. Post a pic of your vehicle full of new finds. Or as you unload them. Or as you clean them. Post a shot of an auction, sale or home where you pick your items. 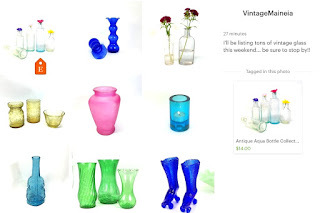 Show off new (or old) finds in an interesting group of color(s) or style(s). Showcase your photo booth or where you stage your items for photos. Did something unusual ever happen? Photograph your items stored in an interesting way. Try a wide angle. Demonstrate ideas for styling and/or using your items. Showcase your items for sale in or on other venues, like your shop or at a show. 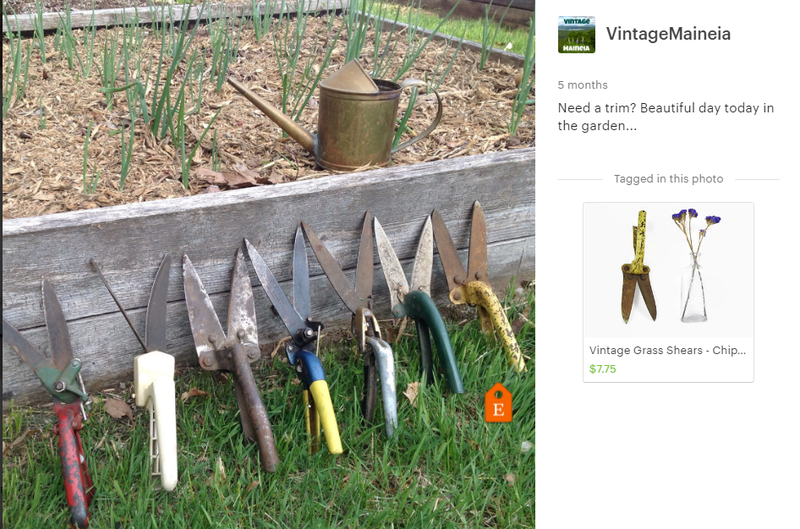 Simplest approach: "just listed is this great..."
Take more item shots than you think you will need for listings. Use the extras for shop updates. Is your home decorated with items in the style that you sell? Can you artfully stage an item in your home and post that? 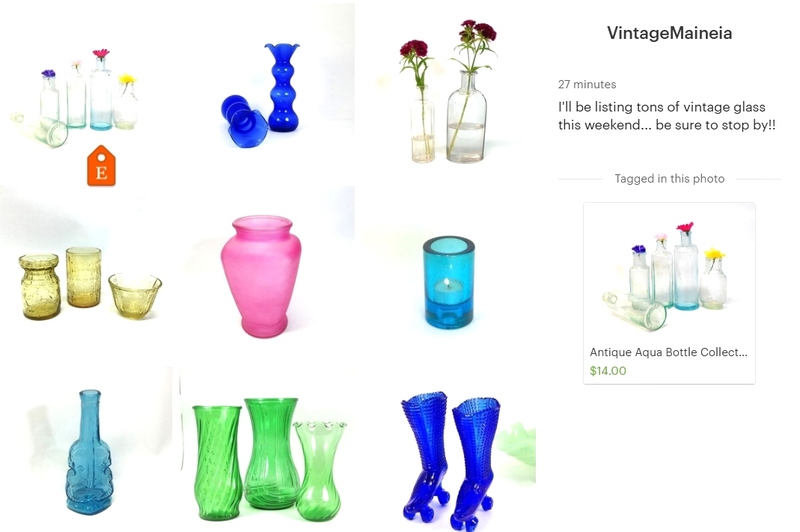 Show an aspect of your life that might be interesting to others and relate to your vintage shop. Make artisticstill-life compositions of items for sale. Photograph and post them. Recombine items for sale. Showcase your item in use. Seasonal inspiration of items – fall scene with fall colored item, snow scene with a winter piece. Re-photograph shop items with a different background, on a rainy day, or in a different season. 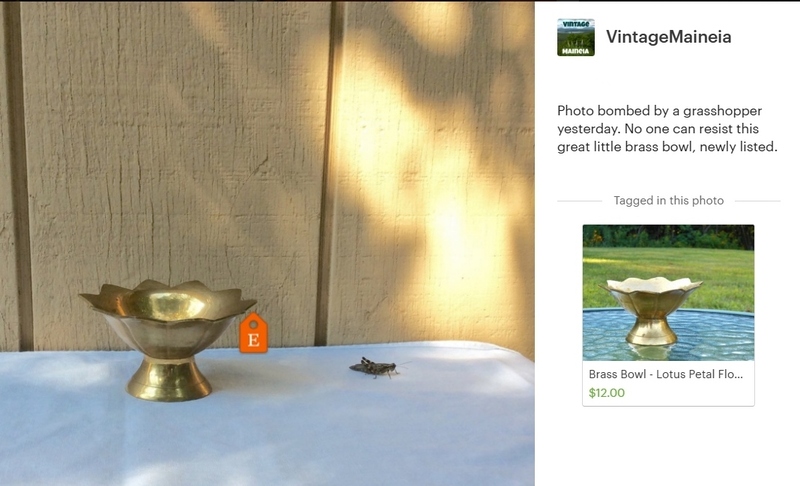 Show off your customer's photos of the item. Item needed: place an Etsy tag on the spot where your item could be. For a vintage souvenir, feature a photo of the place it came from. Showcase your partner, kids and/or pets with your items. Color match your items to something seasonal, especially seasonal Pantone colors. Or color match your items to each other. Post a picture of an item gift wrapped or ready for shipping. Show any extras you send. Offer those who have favorited your shop a “Thank You”coupon code. See how many use it. Celebrate a certain number of sales, items in your shop or feedbacks with a coupon code. Post a screen shot of your latest 5-star review. 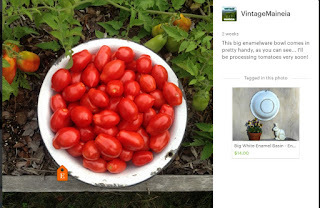 Post a link to your latest blog post or other SM activity. Post a screen shot of a newly stocked shop section. Treasury-style update. I even repeated my photo! Highlight a picture of your item in a magazine, blog, movie or television presentation. Post a screen shot of your items on a Pinterest board, Facebook or Instagram post. Post a photo collage of related items in your shop. Use some special effects on a nice secondary listing photo. This works well for simple retro items. Tie an interesting photo with an item you have for sale. If you are hankering for treasuries, make your own. 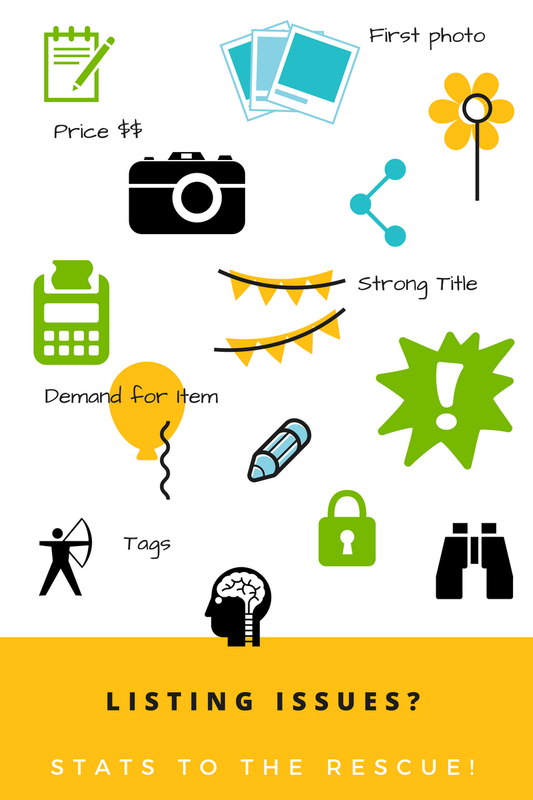 Use a grid on Canva to feature your items all together. Showcase a gorgeous close-up detail of a piece. Post a map (vintage, weather, etc.) with your location tagged. How do you do a shop update? That's the subject of another post.